Check out Paul’s evocative blog post about the Wall and its region. Average rating 5 out of 5 from 372 reviews for Exploring Hadrian’s Wall: Romans, Reivers and Romantics, according to AITO reviews. Day 1: Arrival at our hotel, the magnificent fourteenth century Langley Castle, right in the centre of Wall Country, with views of the Wall itself from the battlements. A baronial residence burned in the rebellion by Hotspur’s father against Henry IV, it was resurrected by a Victorian romantic, and makes a sumptuous base for our exploration of this beautiful region. Welcome drinks and dinner at the hotel. Day 2: A short drive takes us to the east, where we begin with Wallsend’s elevated view of its fort and reconstructed Roman baths before crossing the broad River Tyne to South Shields and its imposing gatehouse. The extensive remains include careful reconstructions where the cramped and ripe accommodation for the soldiers contrasts with the huge commander’s house, transplanting Mediterranean living to the far north of the Empire. After a fine lunch, we gain an appreciation of the entire Wall system at the excellent Hancock Museum, a superb location to meet the soldiers, civilians and gods who inhabited the Roman Wall. Day 3: A short journey takes us to Steel Rigg for a walk through the Wall’s most breath-taking, wild and romantic scenery, the hard spine of the Great Whin Sill. This most iconic stretch of the Wall still preserves the feeling of being a frontier, as it drives its way through ragged, undulating terrain with fine views of Crag Lough and through the famous Sycamore Gap. We walk up to Housesteads, the most renowned station on the Wall, where one of its largest forts peers over the Sill’s precipice. Behind it is a civilian settlement where hooded local gods were worshipped, coins faked and an undiscovered murder committed. After a well-earned lunch, we visit the nearby temple of Mithras at Carrawburgh, whose well-preserved remains have much to tell about this enigmatic saviour-god. Day 4: A day which allows us to immerse ourselves in the daily lives of the people of the Wall. We spend the whole morning at the extraordinary site of Vindolanda, one of the most important in the entire Roman Empire. Here, the environment has preserved a bewildering array of everyday objects – personal letters, children’s shoes, combs, even wigs – that allow us to come as close to real Roman life as it is possible to do. The remains of the fort, and the civilian town outside would be impressive even if they were not continually changing with the excavations that will be producing new insights as we visit. After lunch, a gentle walk past the exceptional milecastle at Poltross Burn brings us through attractive countryside brings to the Roman bridge at Willowford and over the intermittently turbulent river. We’ll then climb the rise to Birdoswald fort, perched on a great and dramatic spur which sweeps down majestically into the Irthing Valley, and whose fort buildings were used through the Dark Ages and into Mediaeval times. Day 5: We begin the day with a visit to the Roman town of Corbridge, hidden in a quiet spot by the Tyne. The singular, undulating, rumpled-carpet appearance of the site which you see walking down the main Roman street is owed to the many layers of remains sagging over each other as you pass shops, granaries, fountains and houses built over a series of early forts in this idyllic place. We move on a short distance to the pretty market-town of Hexham, visible from Corbridge, to visit its Abbey, begun in Anglo-Saxon times. Fragments of Roman buildings and inscriptions built into the ancient and long-hidden crypt beneath the lofty walls of the Abbey allow us to see where so much of the Wall went. You are free to choose a place to lunch and wander the charming streets of this attractive town so central to Border history. From the respectability of Hexham, we return to the Wall at Chesters, here set in gently rolling riverside parkland. Beautifully framed by wooded low hills and the churning river, Chesters is blessed with a fine Edwardian museum filled with a mass of inscriptions and finds enriching our knowledge of the lives of the Roman-era inhabitants and the bewildering array of gods they worshipped, and the best Roman baths on the Wall. The evening is free to dine at your leisure. Day 6: We pass beyond the western section of the Wall and through breath-taking stark hills looming over deep, winding valleys and roaring becks to the Irish Sea coast at Maryport, to see how the Roman frontier involved far more than the Wall alone. Standing sentinel on a bluff with views of Scotland and the Isle of Man, Maryport houses an internationally-important collection of altars to the great state god of Rome, Jupiter Optimus Maximus, and some delightfully rustic images of less far-famed deities. Afterwards, we return to Cockermouth in the Lake District for a tour of one of England’s finest breweries, and a well-earned sampling of the product before heading back to the Wall country. To cap a day in which we’ll have seen so much of the raw beauty of nature, our final destination lays bare how the Roman Wall faded, was reused and likewise became the stuff of Romantic adulation by visiting the distinctive red stone priory at Lanercost. Now a restful ruin, it stamped English mediaeval civilisation on an area buffeted by conflict, and was home to Edward I on his last journey north. After falling victim to Henry VIII it drew the interest of Victorian Romantics, including decoration by the Arts & Crafts movement. Day 7: Today we see how the border country was tamed after a long period as a mediaeval battleground. We begin on the east coast with the magnificent castle of Bamburgh, soaring on its impregnable craggy rock, and trace its history from being an Anglo-Saxon royal centre, refuge of saints and target of Vikings, through its time as a mighty English royal fortress, philanthropic school and finally, to being stately residence of the Victorian industrialist and inventor, Lord Armstrong. After lunch, we travel through the hilly wilderness west of Bamburgh to Armstrong’s masterpiece, his house nestled in the forest at Cragside surrounded by sublime lakes and woods, tiered rockeries and gardens spilling down to a fine iron bridge spanning a pretty stream. The natural beauty of the site is brilliantly balanced by Armstrong’s ingenuity in the house, the first to use hydroelectricity, and filled with the paraphernalia of civilised and refined modernity. After a rich and rewarding day, we have our farewell dinner. Our transfer vehicle will collect from Newcastle International Airport at 16.30, and Newcastle Central Station at 17.00, should you wish your arrival at your hotel to be organised by us. If you prefer to arrange your own arrival, check in time is set for 14.30. Check out time is 10.30. We will arrange a transfer from your hotel to Newcastle Train Station and Newcastle Airport leaving from your hotel at 09.30. The cheapest way to book flights to join this tour in the United Kingdom is directly with the airline online. If you are not from an EEA country you must have a valid passport to enter the UK. It must be valid for the whole of your stay. You may also need a visa, depending on which country you are from. You can check if you need a visa by using the link below. If you are thinking of extending your trip to the United Kingdom to include visits to London, South-Western England, Wales or further afield, please contact our office for advice and suggestions for bespoke travel plans. This was our second tour with Peter Sommer Travels. We were most pleased with all aspects of the tour which was well organized around a historical itinerary. The daily agenda, hotel arrangements, dining experiences and professional tour guides all exceeded our expectations. The care, comfort and safety of the client are the first priorities for Peter Sommer Travels. 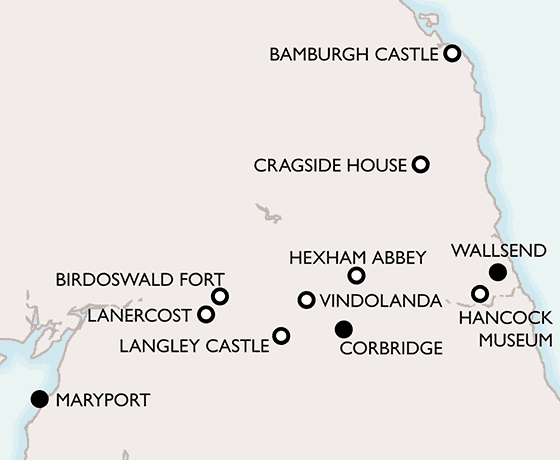 We can most heartily recommend Peter Sommer Travels and specifically their Exploring Hadrian's Wall without reservation.